In 1940, philosopher Mortimer Adler wrote the best-selling classic How to Read a Book. Over forty years later, he penned its companion volume How to Speak/How to Listen. He writes: “Engaging in good conversation—talk that is both enjoyable and rewarding—is one of the very best uses that human beings can make of their free time” (17). Conversation is interrupted speech and it is impossible to be skilled in this without learning how to speak and listen well. In Part One, the author establishes the four uses of language: writing, reading, speaking, and listening. People in the past were better listeners because there were fewer books. More than ever, the modern man must be taught how to listen well. Speaking and listening is more complex than reading and writing because it is social and transient, always involving human confrontations. Part Two addresses uninterrupted communication such as persuasive speech. Adler distinguishes this from “sophistry”, the use of clever arguments to convince people. This is a misuse of rhetoric by using unscrupulous means to persuade others. Rather, all persuasive speech contains ethos (the establishment of the speaker’s credibility and character), pathos (arousing the emotions of the listeners) and logos (the marshalling of reasons and arguments to establish your point). The logos well-stated is what will ultimately tip the scales in the speaker’s favor. 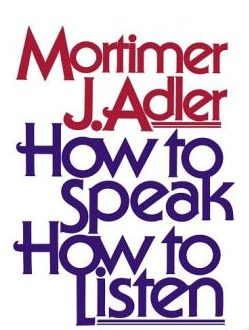 Part Three applies Adler’s fifteen rules of reading to the skill of listening. He avers that listening is primarily an activity of the mind—not the ear—and must be active. Listening is not keeping quiet, but involves the constant asking questions (with the mind or mouth). Part Four surveys the different forms of dialogue or two-way talk, like the question and answer forums and the seminar (teaching and learning by discussion). The Christian should be understood and zealously seek to understand others. This procedure is time consuming because it requires patience and persistence. Strive for what Adler calls “the meeting of the minds”, and let chapter 12 guide you. The husband and father should cultivate the contents of chapter eleven (“Conversation Profitable and Pleasurable”) into family time conversations. Earnest, lively dialogue must be taught. I have yet to find a clearer, more concise guide than this tremendous chapter by Adler. Every missionary should gather as many cultures and worldviews as possible around his kitchen table, plop page 192 in the center, and discuss it at length. It may be one of the most entertaining, enlightening, and edifying conversations in a while. The highest form of friendship is the communion and conversation of persons alike in their moral virtue. Treasure this.